Instructions: 20 page color booklet with instructions and comments from Rick Sternbach and John Eaves. Detail: 7 - Good. Overall it looks like Enterprise but get up close and a few errors appear such as as poorly done docking ports and thick detailing on secondary hull. Accuracy: 7- Minor inaccuracies combined with a lack of identity (Nemesis or pre-Nemesis kit) makes for a less than perfect 1701-E kit. Overall Rating: 7 - If you have the money and want a pretty desk top replica, go for it. Serious modelers read on. "Some assembly required. Batteries not included." I could summarize the build of this kit with those two infamous disclaimers but there would be little fun in that. I was not going to buy this kit. I had purchased the NCC-1701 kit was underwhelmed. ^ "Structural integrity has been compromised!" Look at those gaps! ^ The result of the gap. ^ Side by side with the AMT/ERTL kit. ^ These red lights are not present on the filming miniature or digital ship. ^ It appears that Bandai (right) looked to the AMT/ERTL kit (left) for inspiration on the nacelle/strut joint. ^ Decks B and C lack the scale height found on the filming miniature and digital starship. The newly added photon torpedo module can be seen above C deck. Like a motorist passing an automobile accident, however, I was morbidly curious as to what this new offering would be like. With credit card in hand, I ordered my Bandai NCC-1701-E from Hobbylink Japan. As per their usual excellent service, the kit appeared within three weeks at my local post office. 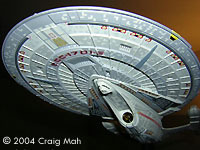 Following the Constitution-refit Enterprise, Bandai released their second Star Trek kit, the Sovereign-class Enterprise in 2003. The first release in their Star Trek series was greeted with mixed reviews. Model makers enjoyed the subject, admired the beautiful pre-painted finish and the look of the illuminated model. Other modelers (myself included) were critical of the fit issues; choice of paint scheme and price. Could Bandai produce a better engineered kit with their latest release? As per usual, Bandai does an excellent job of packaging the kit. Each sprue is bagged separately. All of the parts needed to illuminate the kit (except batteries) are included. 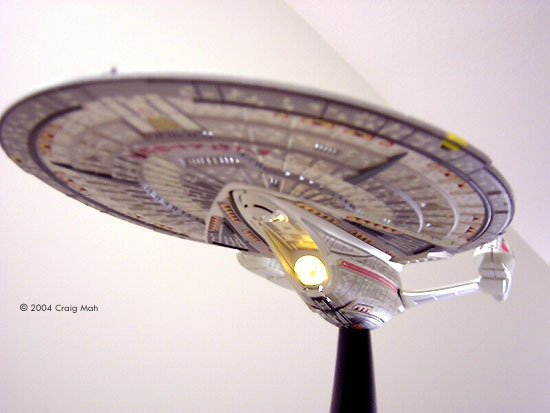 The stand is similar to the one issued with the first Star Trek release. Oddly, I'm going to criticize the stand. I feel that the supporting stand is too thick and detracts from the aesthetics of the displayed model. Bandai must be praised for the appearance of the pieces. The quality of plastic and paint are top notch. The parts are clearly labeled. The illustrations in the instruction booklet combined with black & white photos serve to make the directions easy. The clear plastic skeleton is back. These pieces help hold the hull pieces together and evenly distribute the light within the model. As I discovered, these pieces may be the cause of the poor fit. Bandai refers to this as a snap-togther kit. I would call it a squeeze-together kit. Nothing really snaps together. Rather, you must apply force to squeeze the parts together. To my dismay, the pieces always seemed in a state of flux. Squeeze one part of the model and another part pops out. Squeeze those parts together again and something else decompresses. I found the secondary hull to be the most disappointed aspect of the assembly. I was left with a huge gap running along the top of the hull. I'm not sure why Bandai engineered the secondary hull into four pieces. The fit is simply horrible. There is a 1/8" gap running along the starboard side of the hull. The use of the clear skeletal structure seems to be the root of the fit problems. The plastic (or is it vinyl?) is soft and spongy. The parts on the secondary hull did not mate together properly. I dissembled the hull and tried a few more times before resigning to the fact that I would be left with large gaps. This is most disheartening when the model is lit! There is enough resistance that the parts do not fit properly together. Assembly time was 3.5 hours. Bandai streamlined the assembly process by pre-wiring the saucer bulbs and pre-cutting the other four bulbs to the proper length. The wires are even pre-stripped to quicken the wiring of the kit. The use of foil tape to hide the wires on the nacelles is employed again to the same disappointing results that were found on Bandai's previous release. There were less frustration moments assembling the 1701-E compared to the Constitution model but I was left with some unforgivable seams. Modelers may want to strip down the alignment pins so that the hull parts can be glued together. Since this is a pre-painted kit, the glue must be applied carefully so that the paint is not marred. Perhaps Bandai should re-engineer their future releases so that the hull parts snap onto other hull parts rather than relying on the interior skeletal structure. It seems that their reliance on this method may be the reason why the parts do not always fit properly. For $93 CDN (not including shipping and custom charges) I feel qualified to be critical of the final product. For a kit that is prefabricated, one would think that Bandai would have thoroughly researched this subject. I was surprised at some of the errors. It seems that Bandai has borrowed elements from ILM Enterprise from First Contact and the revamped digital version from Nemesis. This kit seems to be a hybrid of both versions. When Digital Domain was hired to create a new digital model, designer John Eaves took the opportunity to perform some minor surgery to the Enterprise. 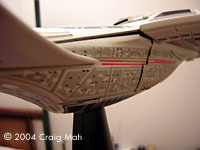 As documented in Cinefex #93, Eaves elevated the nacelles and moved them forward, streamlined the secondary hull and added new phasers (nacelle struts) and torpedo tubes (top of saucer). The only evidence of these changes on the Bandai kit is the presence of the saucer torpedo tubes. These are perhaps minor issues with some modelers but for me, $93 CDN is a serious investment for a 16" plastic replica. 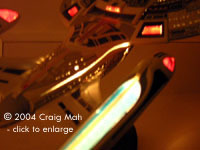 Paint Scheme: The paint scheme is taken from the darker contrasts found on the Nemesis Enterprise. I find the contrast too stark, even compared to the digital Enterprise on the Nemesis DVD. The greys on the saucer seem too dark. Nevertheless, the quality of paint application is phenomenal. Nacelles : It seems that Bandai looked to the AMT/ERTL kit to get the detailing. 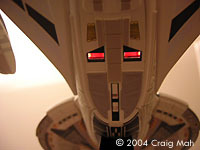 The connection between the strut and the nacelle are identical on both kits. Unfortunately, AMT/ERTL's version is inaccurate when compared to the on-screen Enterprise. In addition, the phaser banks added to the struts on the Nemesis Enterprise are absent on this kit. 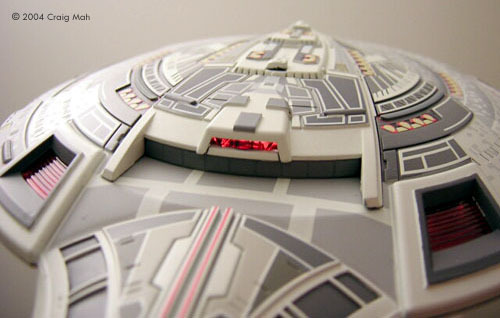 Interestingly, Bandai includes the newly added aft firing torpedo tube on top of the saucer. Flat Saucer : The top of the saucer is inaccurate. Decks B and C are too flat. In other words, they are not tall enough as it appears on screen. Careful examination of the rear of C Deck show poorly molded docking ports. With the careful attention to detail Bandai put into other parts of this kit, I'm surprised Bandai got this one wrong. Dare I say that AMT/ERTL bested Bandai in this area? Mystery Lights : The bottom of the secondary hull features two red lights. There are no such lights on the digital or ILM model! I'm not sure why Bandai would include these lights. 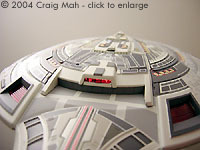 Heavy Panel Detailing : The panel detailing on the top of the secondary hull are out of scale. 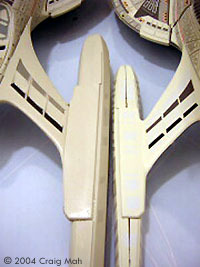 The heavy detailing resemble the type of molding found on a toy rather than a model kit. If scaled up to true size, these panel lines would resemble the trenches on Planet Hoth. This is an expensive kit. In its favour, the model looks great when illuminated. The paint job, as I've repeated in other areas of my review is excellent. To its discredit, the kit has fit problems that result in seams that distract from the appearance of the model. For a $93 CDN kit, one would expect the engineering to be better. I brought it to my local hobby shop for the owners and patrons' evaluation. Their reactions where genally negative. Perception will be the biggest factor in whether you consider this a must-have kit or a simple novelty. Do you perceive this product to be a model kit or a novelty? Since I applied very little modeling skills, I don't have the same attachment with the Bandai kit as I do with my AMT/ERTL Enterprise. I do not feel any sense of ownership over the kit. I have about as much attachment to it as my Arts Asylum and Playmates Enterprises. If it weren't for the fact that the parts come attached sprues, I would seriously question the status of this product as a model kit. 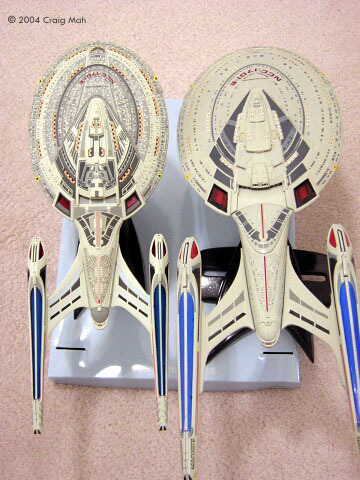 As a novelty, this kit creates a satisfactory replica of Picard's ship. People who collect Enterprise replicas should consider purchasing this model as it will make a nice addition to their fleet. If you enjoyed the NCC-1701 kit, you will most likely enjoy this kit. However, modelers who want the challenge of actually building a model kit can better spend their money on other projects. Many thanks to Craig's wallet for providing the review sample. Manufacturers and retailers, interested in getting your wares reviewed and publicized on a site averaging 3500+ readers a day? Contact us! This page copyright © 2004 Starship Modeler. Last updated on 29 January 2004.